This week, we will continue to draft our essays on our own personal character traits. 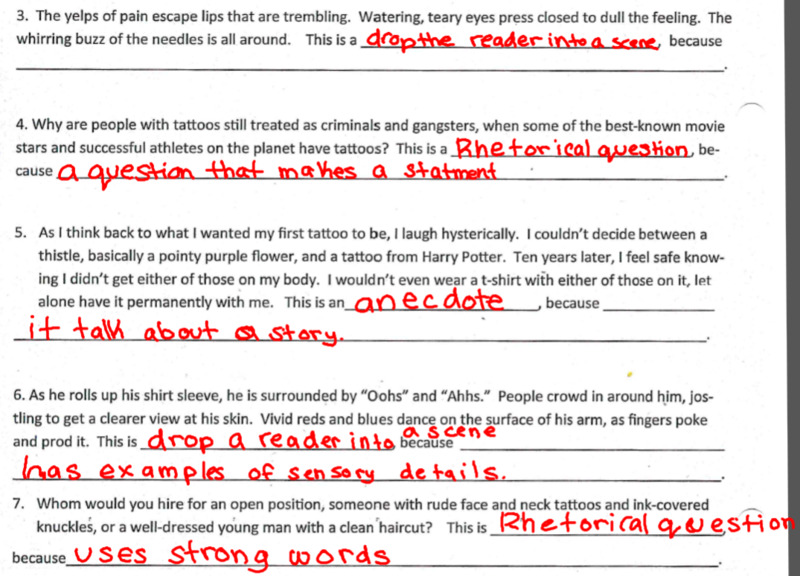 Students should have already rewritten their three body paragraphs with the revisions their partners gave to them. On Wednesday, we will begin drafting the introduction and conclusion paragraphs. 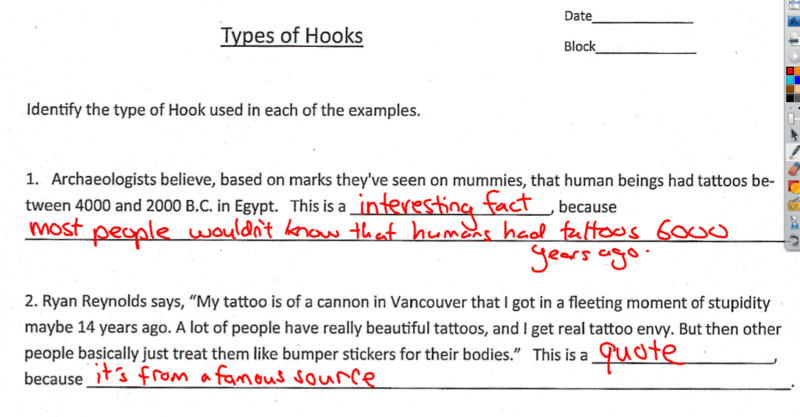 Students will look at Mr. Melvin’s model and many other examples of hooks. 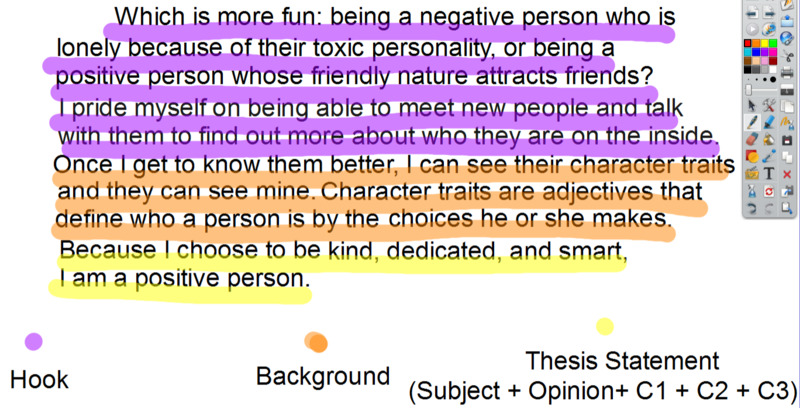 Here is Mr. Melvin’s model of an introductory paragraph, containing a hook to grab the reader’s attention, some background information (defining either character traits or positive people) and a thesis statement (I am a positive person because C1+C2+C3). Mr. Melvin used a rhetorical question for his hook. We will study those and 4 more types of hooks for Wednesday. On Thursday, we will visit the library. We will also work on Conclusions and read chapter 10 and 11 of Liar, Liar. Monday: Complete 2 metacognitive logs after reading for 20 minutes. Six will be collected on Thursday. IXL.com 6th Grade K.2 and 7th Grade J.3 are due on December 21st. Get up to 85 or above on each. Tuesday: Complete 2 metacognitive logs after reading for 20 minutes. Six will be collected on Thursday. IXL.com 6th Grade K.2 and 7th Grade J.3 are due on December 21st. Get up to 85 or above on each. Wednesday: Finish your introduction paragraph, including a hook to grab the reader’s attention, some background information (defining either character traits or positive people) and a thesis statement (I am a positive person because C1+C2+C3). Complete 2 metacognitive logs after reading for 20 minutes. Six will be collected on Thursday. IXL.com 6th Grade K.2 and 7th Grade J.3 are due on December 21st. Get up to 85 or above on each. Thursday: IXL.com 6th Grade K.2 and 7th Grade J.3 are due on December 21st. Get up to 85 or above on each. Friday: IXL.com 6th Grade K.2 and 7th Grade J.3 are due on December 21st. Get up to 85 or above on each.